Spirit Tracks – Spirit Pipes? 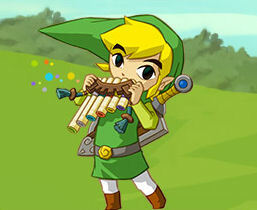 Whether it be the the Flute, the Wind Waker, the Ocarina of Time, the Harp of Ages, or even the Whistle from the original Legend of Zelda, musical instruments have always been a part of the Legend of Zelda series and it appears that Spirit Tracks will be no exception. According to the Official Nintendo Magazine, Link will be able to play the Spirit Pipes, which will be used to summon special powers. To play them you blow into the DS microphone while cycling through different colored pipes with the stylus. Before you’re able to visit a temple, you have to search for one of the land’s guardians, called the Lokomos, who will teach you a song which restores the tracks to the temple. You’ll then be required to listen to the metronome to keep to the rhythm. Nintendo is surely interested in the idea of implementing the Nintendo DS microphone as much as possible with the upcoming Zelda title. An entire item, the Whirlwind, is already completely based around the Microphone, and now it seems like a second item will heavily involve the use of the Microphone. I personally have no issue with blowing into the microphone, but I’d like to get my hands on the game and try it out for myself before giving my final judgment. Spirit Tracks is set to release on December 7th here in North America and on December 11th for our friends in Europe.